Before you get started lets point out that the tasting of whisky doesn't need to be a serious business, it should be fun and enjoyable. And how you do it is always up to you. What works for you is right for you. Don't let anyone tell you different. However, taking a set approach to it will help you get more out of it. Just try it once in a while! Below is a list of hints and tips about appreciating whisky but do remember there are no hard and fast rules except one - enjoy it! Although you may have a favourite tumbler you enjoy your malts from after a hard day, a glass of that style will be ineffective when nosing whisky. The preferred glass would be tulip shaped, with a wide round bottom and a narrow opening, allowing the aromas to become concentrated in the glass. Also, a Glencairn glass is a good comprise in getting the best from your whisky and drinking from a practical glass. Not everyone is lucky enough to live with a fresh supply of Scottish water, not even people in Scotland! So for those who don't we recommend you use Scottish mineral water (basically anything you can find with a low mineral content) or filtered water when possible served at room temperature. Let us mention ice at this point, to get the most from your whisky do not add ice - not if you want to get the most from it. But also, not one wants to drink warm whisky. The first sense we use is sight. The colour and viscosity (how oily it is and clings to the glass) of a whisky can give indications about its maturation, what type of cask was used, its age and its strength. 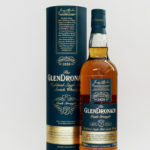 As a general rule of thumb, applicable mainly in single cask whiskies, if the whisky is at the lighter end of the spectrum, buttercup yellows and light toffee gold's, it will have been matured in ex-bourbon barrels and where the whisky is of a darker and richer colour, ambers and mahogany colours, it would have been sherry cask matured. Remember, however, that with single malts each one is made from a marrying of casks so there may be a portion of both types of cask in their make up. The viscosity of the whisky can help tell its age. Tilt the glass to a 70 degree angle and turn the glass slowly round until the inside of the glass has an even coating of the liquid then return it to an upright position. Watch the “legs" of the liquid run down the glass, the general rule is the faster the legs the younger the whisky. But again there are no hard and fast rules in whisky. A quick way to check strength is to cover the top of the glass with your hand and shake up and down vigorously, if a “ring of pearls", bubbles, appears at the edge of the glass then the whisky will be above 50% abv, the more “pearls" the stronger the whisky. It's even better to do this with the bottle - but make sure the cork is back in the bottle. We can also tell if a whisky has been chill-filtered by its appearance. Chill-filtering is a cosmetic process taken to stop whiskies from clouding or hazing at colder temperatures. During the process some of the whiskies fats are removed and with them unfortunately go some of the flavours. A chill-filtered whisky will always be clear, before and after the addition of water where as a whisky that is unchill-filtered may well be or become hazy before and after the addition of water, no indication of bad quality at all. Now we are ready for the first advance of the nose. Always remember the importance of nosing; Master Blenders predominantly pick their casks on their aromas alone, without tasting them. Be careful not to plunge your nose right in and take a huge sniff as the vapours can be very strong, especially with cask strength whisky, and can burn your nostrils. Take a sip and roll the whisky around your mouth and over your tongue, think about the spirits texture; is it thin or viscous, spirity or dry? Next think about the taste. The tongue picks up four basic flavours: salty and sour at the sides of the tongue, sweet at the tip and bitter at the back. 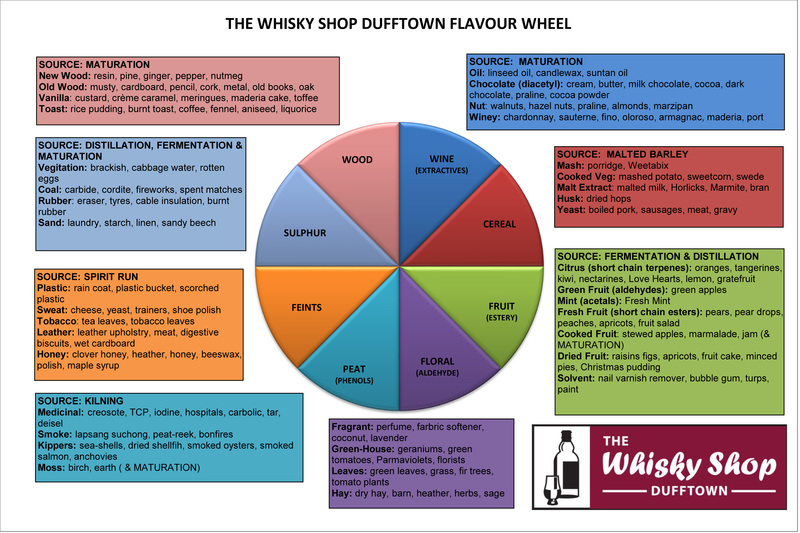 At what intensity does the whisky have these flavours present? Also, how long does the taste stay in the mouth, the finish, is it long or short? Now add a little water. Professional tasters may water the spirit to 20% abv but this might not suit you, or the whisky you are tasting. Older whiskies may take less water, peaty ones may take more. It is best to experiment by adding a little water at a time, assessing it until you find the point it is giving off its best, aromatically. Take notes, let loose, where we have four primary tastes and five primary colours there are 32 primary aromas so there are plenty to choose from! The sense of smell can provoke wonderful memories and colourful descriptors. Now taste again after the addition of water and reassess and take note of the balance of flavours and viscosity. Now it is time to make your final notes about the whisky and how it made you feel overall. Here's a bit of help with some of the aromas you may find. This is always work in progress for us at The WSD and that because it can never be a definitive list. What you smell is what you smell and do not ever let anyone tell you that you are wrong!! !